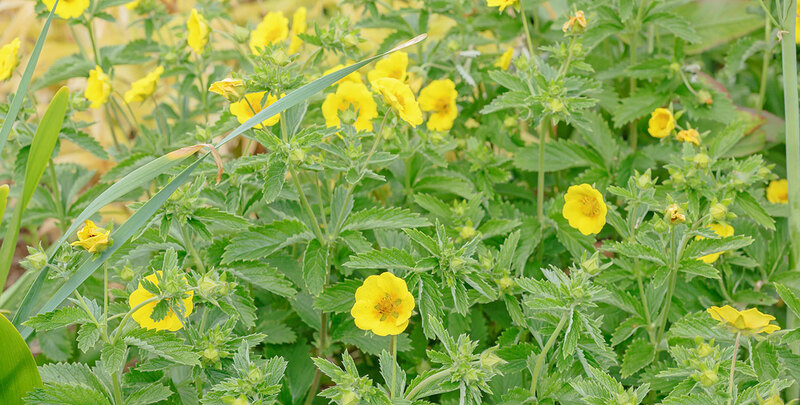 Potentillas are quite versatile, multitalented flowering shrubs suitable for making low hedges. 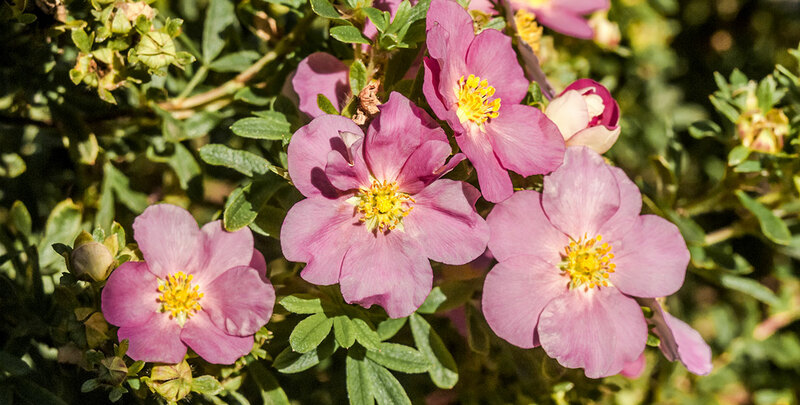 If you are thinking of establishing a colourful border without having to add frequent maintenance to the formula, potentillas might just be exactly what you are looking for. While you could simply pick the potentilla hedge of which the colour appeals to you most, we would recommend creating a mixed potentilla hedge, consisting of more than one variety. Because of its colourful five-petalled flowers, single species potentilla hedges are wonderful, but mixing different varieties of potentilla allows you to get the most out of their delightful colours and will really take your garden to the next level. This will give your hedge a multi-coloured appearance, but it is also possible to extend its flowering season this way. The extraordinary long flowering period is already one of the features that make potentillas stand out from other deciduous hedging plants. Once they have begun flowering, it will almost seem like there is no end to it. It is also possible to combine potentilla hedges with a backdrop of evergreen hedging plants, which besides accentuating the striking colours of the potentilla flowers, have the additional advantage of concealing its unappealing bare branches during the winter months. If you would like your garden to be as colourful as possible, you could consider mixing the white flowers of the ‘Abbotswood’ cultivar with the yellow blooms of the ‘Goldfinger’ and the red clusters of the ‘Red Ace’. Most of these varieties flower from June to October, but the latter even starts flowering in May. Potentilla has been a popular hedging plant for a long time. It is native to the relatively cold Northern Hemisphere and will therefore feel right at home in a British garden. Potentilla fructicosa is undoubtedly the species that is most commonly used as an ornamental plant in our part of the world. While its nickname “barren strawberry” may not make the potentilla sound very appealing, this name was only given to the species due to the fact that it strongly resembles the strawberry, with the notable difference that its fruit is dry and inedible. Another common name for the species is shrubby cinquefoil, in reference to the five leaflets of which its leaves are comprised. 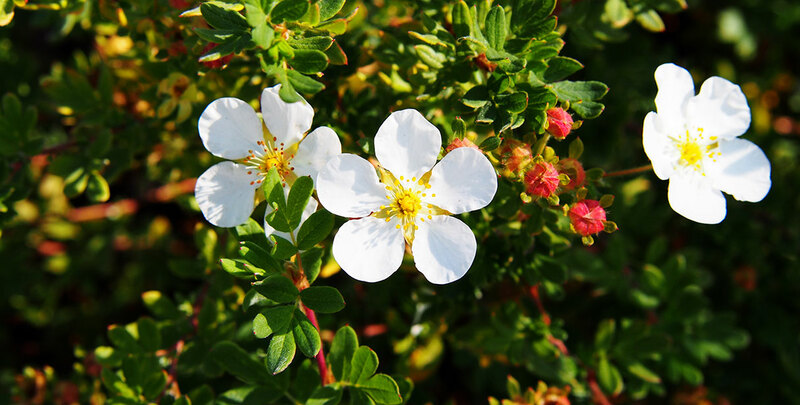 While “potentilla” is actually the name of the genus, the fructicosa species are so common in our part of the world that this name is most commonly used to refer to this particular species. Its name means “powerful” and actually refers to its medicinal qualities, for which the plant is traditionally used. As potentillas are very hardy and do not require a lot of maintenance in order to reach their striking appearance during flowering season, they are often planted in public parks. The species does not have much to offer other than its ornamental value, but that also allowed nurseries to focus on its appearance exclusively. As a result, a number of gorgeously coloured cultivars have been established through the years. The strength suggested in the name of the potentilla is reflected in its tolerant, versatile nature. Potentilla hedges are exceptionally all-round, tolerating a wide range of soil types and positions without requiring regular maintenance. In fact, they are not many hedging plants that require less maintenance than potentilla. They will grow happily in poor soils and can cope with drought and shade. As is to be expected of flowering hedging plants, however, they certainly prefer a position in the full sun. A potentilla hedge will only need to be watered during prolonged periods of exceptional drought or when you plant it in a light, sandy soil. It will feel most at home in a well-drained soil of average moisture, but it might still thrive on other soils. Pruning is hardly necessary, unless you prefer to keep your potentilla as a formal hedge. However, we would like to recommend you prune your potentilla hedge after flowering, as this is beneficial to flowering in the following year. Though the species responds very well to pruning and can therefore be cut back to its desired height fairly easily, you can choose to leave it completely unpruned if you are looking for a hedge with a very informal, natural appearance. We would like to advise against using fertiliser, as potentillas are native to soils that are quite poor and therefore, applying fertilisers is not beneficial to their health and development. 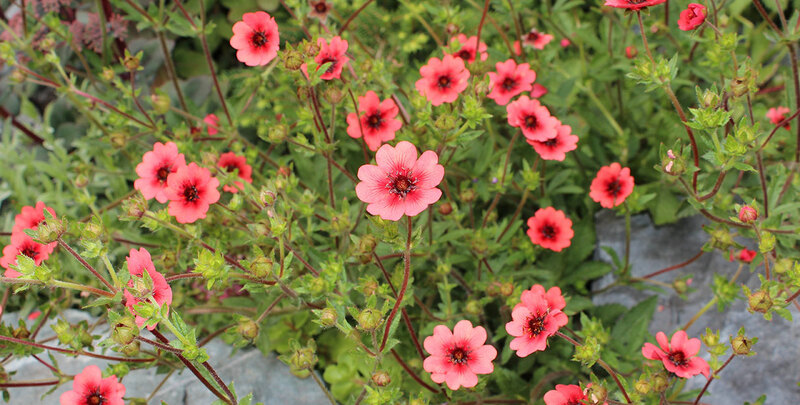 With all the beautifully coloured potentilla cultivars that are available, we can imagine that it is sometimes difficult to choose the right colour for your garden. Luckily, you do not necessarily have to pick just one variety. It is possible to combine different colours of flowers with consecutive flowering seasons and as a result, enjoy the beautiful flowers of your mixed potentilla hedge for the longest time possible. The beautiful, coppery orange autumn colouring of its grey-green leaves adds an additional dimension of colour to your hedge. It is even possible to create a mixture with an evergreen backdrop to make your garden stand out during the winter months, when the potentilla itself has a relatively dull appearance. Despite that, a potentilla hedge is recommended to any garden enthusiast with a fondness for flowers, as the species has an exceptionally long flowering season. It is even possible to extend the flowering season of a mixed potentilla hedge beyond that of a single species hedge, as some cultivars start flowering as early as May. And since potentillas are very easy to maintain, a mixed potentilla hedge provides a surprising amount of gain for surprisingly little pain.